I've been working on an idea and reached a point where someone with far more C experience than I is needed. I'd like to be able to create wall texture pages in code. The purpose for this is that I want to be able to combine two wall textures into one without affecting either of the starting textures. I think that the ability to create a new memory page for this combined wall is necessary. ie: from drawtexture (the ceiling and floor routines)... you tell it what texture to use.. it grabs it.. and draws... in this case you would have to tell it 2 textures... combine the 2 as you require in the array... and then tell it to use that. So... for a ceiling/floor... No problem... but for walls... well... still possible, but with greater code modifications. PS: Mind if I ask what you are planning or trying to do? It's just the method of storing the combined wall textures in memory. I guess I'll have to make an array of byte arrays and point HitVert/HorizWall to that. I'm hoping to add the ability to have wall-patch modifiers. ie: Take the normal Gray brick, tell it to add the hitler pic. Voila, new texture. This will allow the re-use of wall decorations and reduce wall redundancy. I think this will also allow you to work around the 64 wall limit. You can make 64 base walls with 255 wall patches available for each base wall. The wall decorations are stored in separate chunks (right before the doors) and use the transparency color as expected. I suppose the decoration could be a whole new wall and extra walls could be added like that if one would want to do that. Maybe I'm off my rocker - or a few fries short (for the McD's fans out there) - but I think this could be cool and useful. decoration on any wall base? that it could also draw sprites on the walls? This is one of the most interesting ideas I've seen yet. With permission, I would love to use such a feature for Helvete. This would make life much much easier! Thanks. I think it'll make some things easier to handle. Now, that ProcessCombinedWall () part is the trick. I know about 2% of C memory management. I assume I need to somehow memory for this new texture, draw it, and then unlock it. Correct? Or is there an easy way to make and return a byte array? @ChiefRebelAngel: Of course you'll be able to use it, if I can get it written. @BrotherTank: Thanks, I'm looking into it, it looks like I'm having trouble passing the array to *( ((unsigned *)&postsource)+1) because I'm getting tutti frutti when I run it. I can pass nameofarray into PM_GetPage? ! @#$%^&* I think I'll slap myself silly if this works. EDIT: It didn't Type mismatch for the parameter. Should be int, but I get the feeling that if I pass (int)nameofarray, it won't work. It compiled with (int), but I need to test it. EDIT 2: It works!! And as far as I can tell, there was no drop in FPS, which is good. Was the magic pass phrase (where patchedwall is nameofarray). OK, now on to how the best way it'll be used. The only things I see against using sprites is 1) one would also have to set up an object for the patch texture, taking a bit more memory and a bit more code and 2) I'd have to do a bit more coding to interpret the sprite page (not a big deal since it's already in there). Having the special patch wall spots could be a pain too, since they are a new beast. EDIT 3: OK, It has some bugs yet. Mainly disappearing/changing wall textures when at different angles. 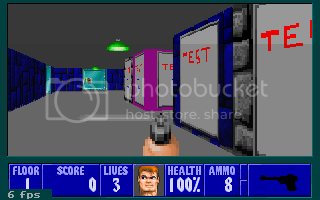 BTW, ignore the FPS count.. DOSBox mucks with it and makes it very low. It's a constant 70 on my machine. This wall should be gray stone, not a hitler pic wall. Sorry this doesn't use sprite frames yet. I started with the wall patch idea, so I kept going with it. Converting it to sprites shouldn't be too hard. I think the problem the code is having is based on what I mentioned previously... Ie, is it the same texture as last time drawn. So that you can add "&& !CheckAdjacentTile(xtile,ytile)" into the "if (lastside==1 && lastintercept == xtile && lasttilehit == tilehit)" line in both the HitVert and HitHorz Wall routines. This alone will fix the door bug problem.... ie put 2 doors... 1 north and 1 east in the same corner of any room... then open one of the doors... Without the above fix, it will make the door sides on the open door disappear on the side nearest the closed door..
@BrotherTank: The bug is still there with those changes. 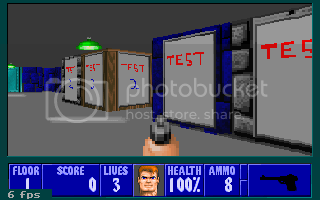 The FPS drops to 20 with the four walls. I can't have it always creating the combined texture. It needs to have a more elabotate storage, which I *think* I can handle. I'll just create an array of about 20 byte arrays, each having an ID that can be checked to see if the wall needs to be created an all that. That might help the FPS, but the purple wall bug is a more difficult problem, I think. It acts as though it passes the wrong wallpic to ApplyPatch or something. 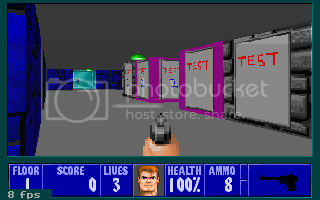 By the way, In WL_Game.C, I added the red line, so that only the lower byte was read when seting up walls. Other than that, no other code changes. and 501 or 01f5 as the modifier identifier for patch 2 - Both of these go into the Sprite or Object data... So now it's place floor tile value on map... apply patch number onto floor tile... then place walltile to be patched on the spot on the map requiring it. // This works, but the patch gets overwritten. What this will do is only have it combine and create a graphic on the fly when the modifier is set on that graphic... else... it will just grab the original wallpic. This will reduce overhead and should bring back your framerate... Of course, the more patched walls the slower the framerate... but it shouldn't affect it that much on faster machines. This is a really kool idea, perhaps when you guys have finnished fixing it, you would supply a tutorial? Does this also mean that walls can have transparent colours aswell...? @BrotherTank: OK, I see how the sprite graphics can be more easily used now. Thanks. However, your ApplyPatch is essentially the same as mine - except for using sprites. But I think that PM_GetPage returns the compressed sprite data, so that would also have to be interpretted. As for HitVert/HorizWall: patchedwall can't just be passed into PM_GetPage because it expects (int). The drop in FPS is due to the wall(s) be re-created every frame (since one memory location is being reused for all the walls). I've not tried this code, but I don't see the difference that will fix the problem. Sorry, maybe I'm just missing something. @andy3012: Yes, there will be a tutorial made, but no wall transparency... closest thing for that is a directional sprite. By telling it to only Apply the patch if the location MAPSPOT(xtile,ytile,1) >= 500 that will stop it from generating the graphic each time, or at least trying to, and then returning a value of true or false.. This should greatly reduce the overhead on the raycastor... and if you assign lasttilehit the higher value there, then you would save a few bytes because of less code (no need to look for the same if condition twice). Effectively what I have done is said get the base image from the mapplane 0... from wallpic... and then get the modifier page from the sprite mapplane 1. And only do any of that if the mapplane 1 is a value of 500 or more. So moving the if statement I had inside ApplyPatch to HitVert/HorizWall fixes the bug? Well, I tried yours and still get the FPS drop and purple wall bug. Setting lasttilehit = 999; causes the wall to be recreated each frame in both of our code. That causes the FPS to drop since your ApplyPatch proc will always be called when the wall is to be drawn as well. Purple walls, I don't know why. EDIT: Purple walls are happening because the wallpic's page is getting overwritten. So maybe I've mucked something up somewhere with my testing, I'll try a fresh copy. Do you get the purple walls too? Try getting rid of the lasttilehit = 999 lines... I notice no difference with or without it, except the FPS stays at 70 without it. EDIT: Right now I'm not worried about the FPS as much as the purple wall bug. @BrotherTank: Yeah, I'm starting to give up as well, but I'm still going to toy with it I think it could be done... somehow. I don't get the repeated wall pattern. Everything on mine shows up as expected, except for the purple walls at some angles. My test map is based on e1m1, and standing on the other side of the door at the end of the hall (not a cell door) and looking south at the added walls does some funky stuff. When the door is all the way open, they're purple. When it gets about halfway open/shut though, they correct themselves. Strange. I tested all values when the purple wall occurs, and they're good. However, when this happens right after "scan = PM_GetPage(wallpic); "
*scan will be 255, meaning the original wall's page has been altered, but using the ALT-Tdebug codes, the wall appears correctly in the box (still wrong in the game) though. EDIT: Upon further testing I find that (scan == pscan) when the wall purple. So the pointer starts to point at the wall patch for some reason. Without the lasttilehit=999 all the walls behind the guard go to merged texture 1... With the =999 then I get proper merged... regular wall... regular wall (unless I hit the right angle and then it shows merged 2)... and on the righthand wall I get the merged 3... The FPS drops drastically with the 999, but it is needed so that you don't have the whole wall as the same first merged texture..
What a feature! 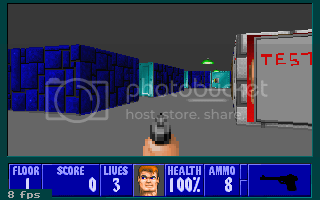 I think I'll add it to Wolf3D Fully Featured!!! @TexZK: Yes, but can you make it work 1) without the FPS slowdown and 2) without the purple wall bug that I seem to be getting? EDIT: OK, I got mine working. No more purple wall. The problem? I called the PM_GetPages right after each other. I seem to remember that the floor/ceiling textures would do this at times too, but I can't find the post. EDIT 2: Also note that you shouldn't try this in anything you plan on releasing yet as this code is rough and liable to changes as well as incomplete. This isn't working... If you have figured out a solution to it, please post it here. If you haven't fixed the problem which Adam and I have been trying to fix, then please don't install it as it is a speed killer. The problem is, in order for it to display different merged graphics or a merged graphic and a wall of the same base - side by side, you must change the value of lasttilehit. When you do that the FPS rate bottoms out. Also there is a bug in viewing it. Based on the angle that you look at certain walls, the graphic will change. Yep... That is a problem when trying to grab two graphic pages that aren't sequential. That is why most suggest that if you want to use completely seperate textures for floor and ceiling that you break the routine into seperate parts. If you grab texture and texture + 1 ... it never happens. As for this routine.... I've tried a few more variations, but it still has the angle bug and/or the fps bug. While I think this is a great idea... I'm not sure how to go about keeping the raycastor at a decent FPS and get rid of the view angle bug as well.